UK-registered address is a Chinese supermarket Owners have no idea of what CNTCI is Asaga calls for Osafo Maafo's resignation ANOTHER MAJOR scandal has rocked the $300 million loan agreement signed between the China New Techniques Construction and Investment (CNTCI) Ltd and the Government of Ghana. Information gathered by Gye Nyame Concord indicates that the address provided on the records of CNTCI Ltd during its registration in the United Kingdom is different from what was provided to the Ghanaian Parliament. Worst still, the new address has also turned out to be what sources among Ghanaian students at the University of Cardiff, Wales, say is a mini-size Chinese supermarket near a Chinese restaurant. And like the operators of the £18 per cut 150 Hammersmith Road hairdressing saloon located at the address provided to the Ghanaian Parliament, the Chinese owners of the supermarket at the end of the registered address of CNTCI also have no idea of the Chinese-owned but UK-registered company and its affiliate in Kowloon, Hong Kong, initial checks show. Concord also confirmed that true to CNTCI's own self-prepared “due-diligence” report labelled “Appendix 1, which was presented to Parliament in April, the proposed lending company was established on May 27, 2003. However, the Chinese management of the Chinese supermarket at the above address told Gye Nyame Concord sources when reached Friday that they were unaware of what CNTCI was. 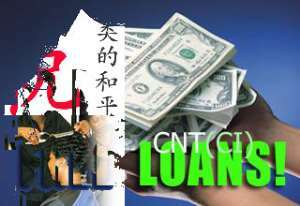 CNTCI under the controversial loan agreement approved by Parliament last month is expected to lend Ghana $300 million, though parts of the same agreement suggests that CNTCI's self-proclaimed subsidiary, CNT Group (HOLDINGS) Limited of Hong Kong, was also a lender. Ms. Debbie Taylor, owner of the saloon located at the 150 Hammersmith address provided by CNTCI to Parliament through Finance Minister Yaw Osafo Maafo, according to radio reports monitored in Accra, has threatened to lodge a formal complaint with the UK police over the misuse of her hair saloon's address by the estimated $4.5 billion plus CNTCI and its partner companies. Interestingly, the saloon does not even work on ethnic African hair such as that of Ghanaians. Meantime, Minority Spokesman of Finance and MP for Nabdam, Hon Moses Asaga, who was the loudest backer of the CNTCI loan when it was presented to the House, has suggested that Finance Minister Yaw Osafo Maafo resign over the unfolding scandal. Responding to criticisms by his fellow NDC colleague, Dr Tony Aidoo, that he should resign for indicting the party by voicing out unfounded praise on the loan agreement and the lenders without enough due diligence, Asaga told the Accra-based Gold FM that the demand should rather be directed at Osafo Maafo. According to him, it was Osafo Maafo who should be made to resign since they had all trusted the Finance Minister's claim of having checked the bonafides of the lender. He also indicated last Friday on both Joy FM and Peace FM that he will lose the trust he had in the ministers of Finance and Economic Planning, and Trade, Industry and President's Special Initiatives if it becomes clear that the two hid something from him and other members of the House before the passage of the $300 million loan agreement.